UK and Australian teams compared a standard statin treatment with a more intensive therapy, publishing results in the Lancet medical journal. They concluded that higher doses cut heart attacks and deaths by 13%. 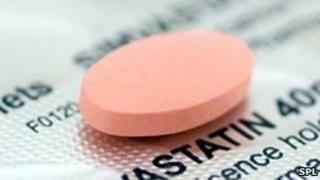 Experts warned that a bigger dose of the most popular statin could produce many more cases of side effects. Statins cut levels of so-called "bad" LDL cholesterol, and the risk of heart attacks and strokes in higher risk patients. Almost two million people in the UK are prescribed them, and one type is even available over the counter at pharmacies to patients assessed as at "moderate" cardiovascular risk. Some studies have suggested that even greater benefits could be achieved if bigger doses of the drug were prescribed. The two studies in the Lancet were carried out at the universities of Oxford and Sydney, and pooled the results of dozens of other trials to give a more reliable verdict on the likely benefits and risks of doing this. In the first study, when a standard statin regime was compared to an "intensive" regime, further drops in LDL cholesterol levels were produced. In turn, there was a 15% further reduction in "major vascular events" - which included a 13% drop in heart deaths and non-fatal heart attacks, 19% fewer operations to treat heart disease, and a fall of 16% in the number of strokes. The other study also revealed falls in LDL cholesterol and "vascular events". Commenting on the study, two academics, Professor Bernard Cheung and Professor Karen Lam, from the University of Hong Kong, said that people with a "substantial" heart or stroke risk should have intensive statin treatment. Even those with apparently low LDL cholesterol could benefit, they said. They added: "At the population level, statins are underused, so the urgent priority is to identify people who would benefit most from statin therapy and to lower their LDL cholesterol aggressively, with the more potent statins if necessary." However, the study authors warned that simply raising the dose of the most commonly-used statin in the UK, simvastatin, the version available direct from pharmacies, might be counterproductive. A rare side-effect of low-dose simvastatin is muscle weakness, known as myopathy. In some cases this can lead to more serious muscle damage. At a low dose, three in 10,000 (0.03%) patients developed myopathy, but when a higher dose of simvastatin was prescribed, this jumped to nine in a 1,000 (0.9%). Dr Louise Bowman, one of the researchers, said: "It may be safer to lower cholesterol using low doses of the more potent statins rather than increasing the dose of simvastatin." This advice was echoed by the British Heart Foundation, which part-funded the study. Professor Jeremy Pearson, associate medical director at the British Heart Foundation, said that simply "ramping up the dose" of simvastatin might not be the best option. He said: "We know that cholesterol is a major risk factor for heart disease - cutting it cuts your risk of a heart attack. However it's been unclear whether going the extra mile to lower cholesterol even further, pays off."